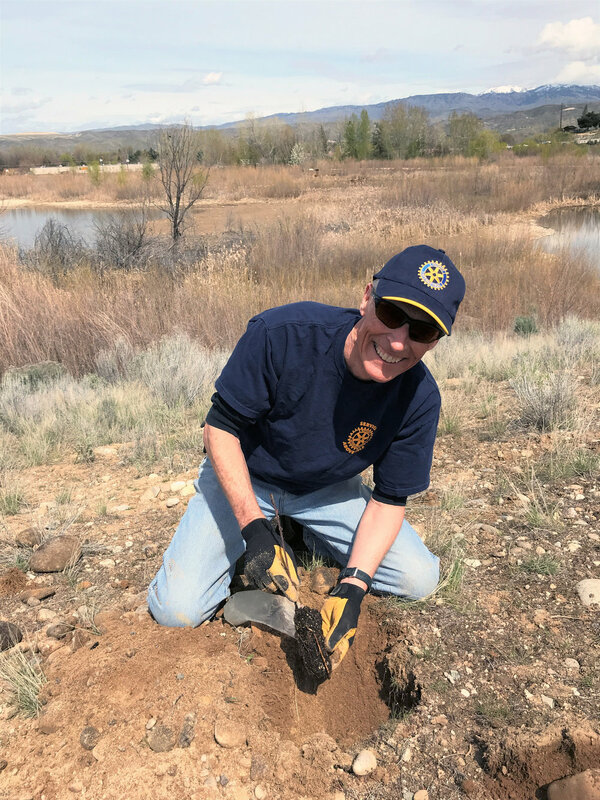 More than 90 volunteers made quick work of planting 550 shrubs at the City of Boise’s Hyatt Hidden Lakes Reserve on April 14 as part of a cooperative project to improve wildlife habitat and decrease fire risk. The volunteers included members of Rotary Clubs from across the Treasure Valley and 32 youth including members of Boy Scout Troop 100 and the Idaho Fine Arts Academy Interact Club. Nestled in a residential and commercial area in West Boise, the ponds, wetlands and hillsides of the reserve blend together to create a unique pocket of wildlife habitat in the center of urban Treasure Valley. The reserve enjoys year-round use by people attracted by the rich bird life, the wide paths, and the outstanding scenery. The 18-month project is led by the Land Trust of the Treasure Valley and Boise River Enhancement Network. The local project aligned perfectly with Rotary International’s 1.2 Million Tree Planting Challenge, a national campaign to plant one tree for each member of Rotary. It also was a great fit for Jayanth Mouli, a sophomore at Boise High School who selected this conservation project for his Eagle Scout service project. The new plants are already changing the look of the hillsides at the reserve, but it’s critical to keep down the weeds that can out-compete the native plants. On April 25, 25 volunteer Weed Warriors took to the reserve with trowels and shovels eagerly digging out thistle, teasel and other weeds. Martha Brabec identified the weeds and demonstrated the best method to use. Many of the volunteers visit the reserve regularly, and they promised to continue the weeding on their own now that they have guidance. The project is funded by the National Fish and Wildlife Foundation and led by the Land Trust of the Treasure Valley, Boise River Enhancement Network, and the City of Boise Department of Parks and Recreation. Project partners include U.S Fish and Wildlife Service, Idaho Office of Refugees by Jannus, Big Brothers Big Sisters of Southwest Idaho, Golden Eagle Audubon Society, Intermountain Bird Observatory, Boise State University, College of Western Idaho, The Wetlands Group, Idaho Weed Awareness Campaign, Rotary International and Partners for Clean Water. Older PostWhy Do Beavers Eat Willows?